Since my wife and I recently downsized, I am making do with a much smaller basement workshop these days. Whereas I could fit as many as four workbenches into my old basement, I now only have a five-by-eight-foot area, that is just enough room for a worktable and some compact, well-organized workshop storage. Large stationary power tools may be out of the question, but there is undoubtedly sufficient room for me to fix things and build small projects like wooden toys and picture frames. 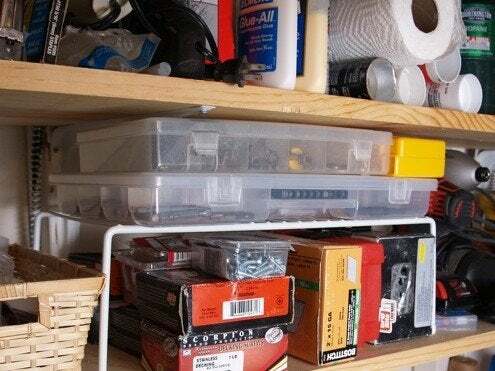 Because I like being able to see the items I need, the design for my new workshop involves a great deal of shelving on which I plan to store everything from hand tools and portable power tools to drill bits and bottles of glue. Everything is within arm’s reach. 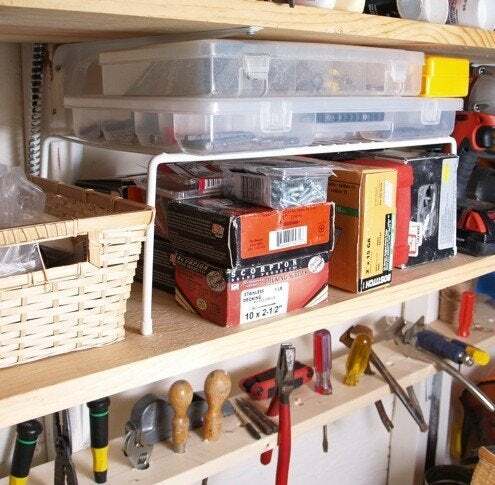 A narrow shelf positioned just above worktable height features bored holes of varying diameters that can hold pliers and screwdrivers. While pliers generally need ¾-inch holes, screwdrivers will fit in smaller openings. Figure out the best combination for you, then get to boring! Plastic tubs (with insert trays for small items) organize job-specific tools and supplies that I don’t use frequently. These stow under my worktable. 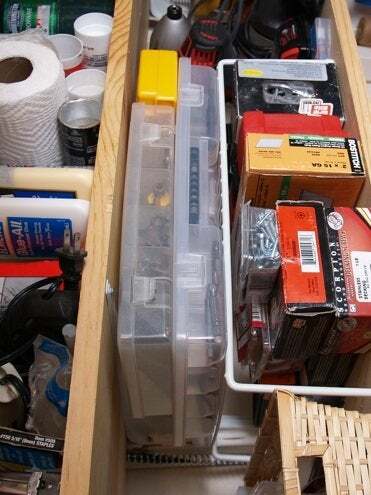 One tub is for electrical supplies, including spare receptacles, switches, and wire. A larger tub holds paint trays, stir sticks, roller frames, roller covers, brushes and the like. A third is devoted to miscellaneous plumbing supplies: propane torch, igniters, propane canisters, pipe cutters, flux, Teflon tape, solder and so on. The safety sack. 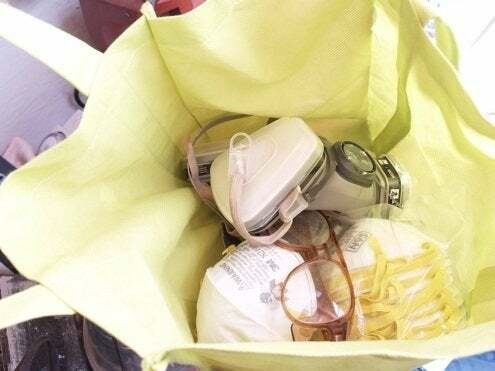 Fill a reusable grocery bag with safety glasses, goggles, dust masks, respirator, gloves and earplugs. Hang the bag on a hook to grab and go when a job beckons. Bungee hangers. 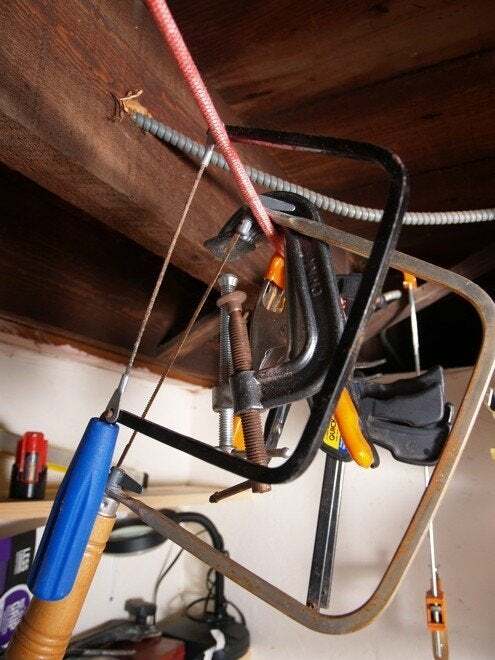 By stretching bungee hangers between the electrical cables between joists overhead, you can create a quick and handy place to hang lightweight items. This is a great approach to storing clamps or rolls of tape—anything with an opening through which you can string the cord. Kitchen and office organizers. 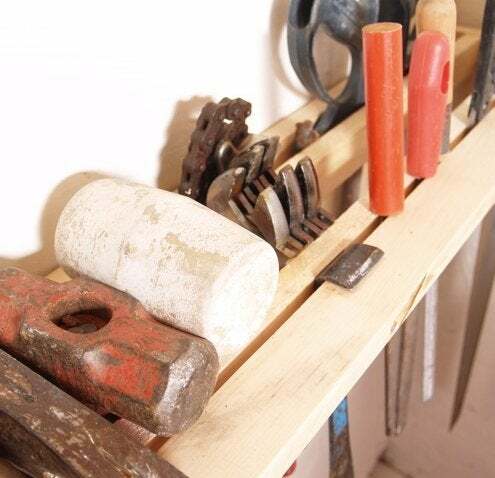 Borrow ideas from the kitchen or home office; if a storage method already works for you in another room, it may be equally useful in the workshop, as well. For example, I’m using a wire mesh “helper shelf”, designed for kitchen use, to accommodate nuts and bolts. Meanwhile, I’ve repurposed an old metal file holder as a way to organize sandpaper. The trick to working successfully in a small workshop is always to keep the area clear of clutter and ready for action. I must admit, I haven’t yet reached that lofty goal, but these ideas have helped me get at least occasional glimpses of my work surface!